Always be cautious using a tree stand. RALEIGH, N.C. (Aug. 8, 2013) — The N.C. Wildlife Resources Commission’s Home From The Hunt™ safety campaign is reminding hunters to be as cautious with tree stands prior to deer season as they should while hunting. “As hunters begin to set up tree stands as part of their preparation, safety is still rule number one,” said Travis Casper, the state hunter education coordinator. Casper recommended using a lineman-style belt in addition to a full-body harness when first putting a tree stand in place. 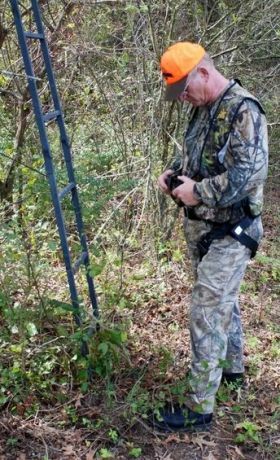 As with any piece of equipment, tree stands need inspection before use. Replace rusted bolts, frayed straps or, if needed, buy a new tree stand. For more information on hunting seasons, Hunting Heritage Apprentice Permits and the Hunter Education Program, click here.